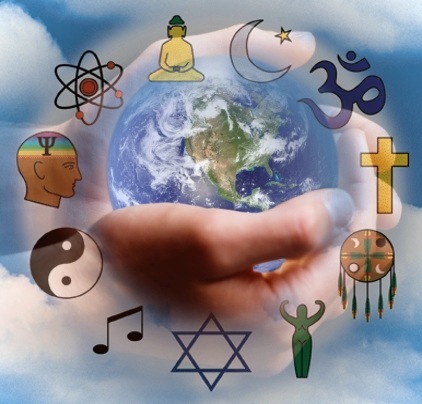 Forums >> Beliefs & Spirituality >> **Cosmic Religion and the New Age** >> IS THERE SUCH A THING AS A COSMIC RELIGION? RE: IS THERE SUCH A THING AS A COSMIC RELIGION? I forgot to tell, I don't believe religion should always transcend a personal God. Without claiming that all of us are or have to be children (though in my opinion all of us are first and foremost the children of God) it would be like taking away candy from a child. Tell a Hindu that he or she must forget all about the child Krishna and they would feel like they had been deprived of their most precious possession. In certain Andean villages of my country, some women are charged with taking care of the Child Jesus Christ all along the year but of course, mainly during the days following His Birth. They bathe him, they change his clothes and, curiously enough, they chastise him beating him on his lower back on charges that he has spoiled his baby clothes. They are said to reach the most elevated and blissful states as they shed tears of happiness; and at a certain stage, they all look transfigured in doing so. Of course, such blissful states are not only caused because it is a divine Child who is involved. Some of the most beautiful literary pieces have been inspired in the suffering of Christ during his passion. I know many scientists will chalk all this up to mere psychological reactions, and while we certainly cannot absolutely deny that there is something like it in such states, there is also a profound something that transcends even that. Those people will say they that have never felt something like that, that not even in their wildest dreams they dreamed there existed something like what they have felt. All pain forgotten, and all their sins forgiven, they feel like they have been touched by God and in a spell, taken to Heaven. And indeed, they reach at those moments higher and higher states of being, like passing from one dimension to the next and from there to the next ... ad infinitum. You may recall, I wrote a poem about my past life remembered. I have a real memory of being somewhere else prior to this life where I was urged, by what felt like my family, to come to this place because I needed to. because of this all fear of death has been removed. As a hypnotherapist I can take people back in time to unravel traumas and stuck states but I don't believe that I can take people back to TRUE previous lives. Here is my poem, you may remember it? My spirit, like a Petrel, soared. Love’s thermal warmth assisting passage. Sea of life, no force can assuage. With wings of faith and heart of hopes. And tenderness with charity elopes. And the energy produces a swirling vortex funnel. The sureness of self, no ego trip. All spirits act as one, His love to share. No pressure to choose, held safe in His arms. Self-judgement completed, I stand, loved. Oh, so loved. How love becalms. Held firmly but gently like a hand, gloved. Decision made by thought and deed. The outcome now designed and set. For other spirits’ needs. All goals reset. In human form encumbered now. The empty void with energy endow. This cocoon, this husk, a mortal vehicle. The hope of years, no recall, shielding. Until recalled to deal with matters. In oblivion’s peace, where no word matters. Where angels envelop me with their wings. I love your poem. It has the power to envelope you in its poetic essence, however ethereal, and to instill it into you until you feel as if you have become yourself the pure essence of poetry. Then, in the wings of that beauty, you can soar like a bird yourself. That is exactly how I have felt myself in reading it. It has that kind of beauty. I remember a dream I dreamed many years ago, probably the most beautiful dream I have ever had. I saw myself flying in the starry night with my arms widely stretched as if I was a huge kite. I was thrilled, beyond myself with anticipation. I felt the air kissing my nostrils, my breathing was a pure delight. A gorge ahead that led into the immense sea attracted me, but far from being scared by it I confidently soared into the sky toward the dawning horizon... it was so exhilarating. Now your poem has brought that dream back into my mind. In whatever way you look at religion, it was, from the start, essential in the emergence and development of civilization. Actually, all the know-how required for the building up of the ancient cultures, from that provided by astronomy to medicine to agriculture, used to be in the hands of the priestly class. Apart from this, religion not only acted as a guardian of moral customs but also as an ethical motivator. Regardless that it might eventually be used for dominion or oppression of the other classes, as was the case later on in fact, it prevented from the start an early dissolution or the gradual disintegration of societies. In its pristine condition, this status-quo would allow for ideal civilizations like Mohenho-daro and Harappa, in India, and Caral in Peru, to vigorously and peacefully flourish during their golden ages, about 5,000 years ago. Thousands of years later, during the early Middle Ages, I cannot imagine how Europe would had come out if the Christian faith had not acted as an inspiring motor for its development into civilized nations. Were it not for it, none of us would exist today. This does not mean that I do not recognize all the evil and errors, all the many scandals and other evil influence, even economic prejudice, caused by both the Church's hierarchies and lower ranks along history. If they seem to have reached their lowest in our days, it is but a reflection of this degraded age, which has continued its descending course along history and seems to be rapidly approaching its end. Sadly enough, the current view in the matter of religion and tradition and of any sort of spirituality among the modern scientists and philosophers seems to be one where the main idea is that God, religion and tradition are no longer necessary. Science and technology alone are the disciplines that will lead the world into a new, golden era. Well, I insist in my belief that God and religion are both essential in how a new civilization is built, in the same way that in a family good parents and sane moral principles are necessary to raise good, healthy children. An article on spirituality recently caught my attention in that it showed how modern scientists and philosophers misconceive how the oldest societies essentially were. However, it showed as well how their understanding can actually agree with precisely how the ancients regarded things once things are placed in their correct perspective. "... We have learned how we all share exactly the same forces of Nature... the same atomic structure as trees and birds." Well there is nothing new here, the ancients knew this perfectly. For them, nature and everything having to do with it was sacred; in fact, we are parts and parcels of it, in the same way that we are parts and parcels of God. "... We are beginning to understand that as far as "relationships" are concerned, our relationship with the planet is most profound and important." As can be seen, scientists are now arrogantly claiming to have just discovered the profound relationships between man and nature. If only they had made comprehensive and inter-disciplinary studies in the ancients' lore, this "recent" discovery would have been made long ago. In fact, hundreds of years ago. Also, they did not make sacrifices to propitiate God. That came later on as degradation set in in the course of time. And the also mentioned "propitiatory dances" were their attempt to identify themselves, as intimately as possible, with the stars and planets by imitating their motions. In this way, they were able to control their subsistence with good agricultural practices based on a profound knowledge of their "Mother" (the Earth) and their "Father" (the Heavens). Something like yin and yang. They indeed had a profound feeling of both the Earth and Heavens's sacredness and, at the same time, they had real science in their hands to help in their development into a civilization. And the priestly class endeavored to keep good moral principles among them in order to ensure a morally healthy society. "Similarly, the idea of 'praying' to a god for a particular request, has also statistically proven to have little effect on an outcome, not to mention the evidence to support a personified creator doesn't exist in any scientific way...rather it is often derived from ancient historical literary speculation and tradition." Well I am certain that if they had deepened a bit more in the nature of prayer they would have gotten different results. If I am not mistaken, current postulates in quantum physics endorse it can be done. However, it is true that native peoples can no longer make, say, rain by means of prayer or processions as they used to do in the past, very probably because the exact formulas and procedures have long been lost. But without going to such extremes, it is a proven fact that all the "primitive" cultures were familiar with the celestial cycles, and notably with the cycle of precession of the equinoxes. How would they know when exactly the solstices and the equinoxes would arrive every year if not? This fact alone enabled them to develop agricultural methods and practices that even now have not been improved. And, Sir Roger... I really Enjoy and Love Your Poem My Friend! As I can see from the Start... there are Good Chances that You may Reconciliate me with Religion.